It is constructed from precision-cut, high-quality foam, and comes encased in an easy-to-clean vinyl cover. Selected colors are available. They are 18" in length, and heights of 6" and 8". Sturdy. Nice cover material. Easy To Use. Comfortable. Everyday. Comfort for lying down. 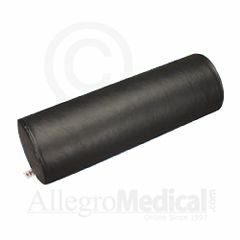 This bolster is the perfect size for going under patients' knees as they lie on a therapy table (or can go just below their feet if they're face down). It is more comfortable to them than going without if they have back pain. The cover material is very nice, and it seems very sturdy. I took a star away for price because I can't understand why a piece of foam with a vinyl cover should cost so much, but they all do. Allegro had the cheapest price I could find on this item, and with a decent shipping rate. Comfortable. Sturdy. Easy To Use. Relaxing. Great to relieve pressure on back.